Quite a lot of my friends keep asking me how do I keep winning such random stuff? And yes it is random, Skincare, giftcards, Scrapbooking supplies and even pet treats. As you may know I'm out of work and in pain a lot. So I need to find something to keep me busy even in my bed most the day.. The answer was Twitter parties! So what is a Twitter party/ Twitter Chat? A Twitter party is usually a chat lasting an hour on Twitter, hosted by a blogger or company. There are questions and answers. For the most part the questions are about you and your family. I've only been to a handful of parties you needed stats or trivia answers to respond correctly. And those usually have given a link to the correct answer. And winners are usually picked randomly. It takes a while for you to get use to the pace of the parties. For me I won a prize after about 5 or 10 parties. But then I was hooked. So you wanna try? First thing you need is a Twitter account. Http://Twitter.com is the website. You can also find Twitter in the App Store or google play. Just sign up with a name you will like. I also recommend you make it something family friendly. I'm not saying you won't win a prize if you have profanity in your name but why risk it? So you have gotten your Twitter name? Now what? Find a few friends you know by posting your link on Facebook or whatever social media you like to use. Just don't try and follow 1000 new people in the hopes to have a large following. Start slow. So now that you have an account and maybe some followers, what to do? Tweet! But what to tweet about? Anything you like. Just say Hi! Tweet about what your doing. Or retweet something you find interesting. I always add back who follows me too☺️ So what if you looking for more Twitter parties? Maybe the ones I'm attending don't fit your interest or schedual. Google is your friend...Just google search Twitter parties. There are some great sites with lists of upcoming parties. And others that offer other info on how they work. Ok so let's say you found a party that is about a subject or brand you love. Then what? Most parties have an RSVP page. So RSVP! Most will ask your name and URL. You name is usually your Twitter handle, eg @chidivaonadime. 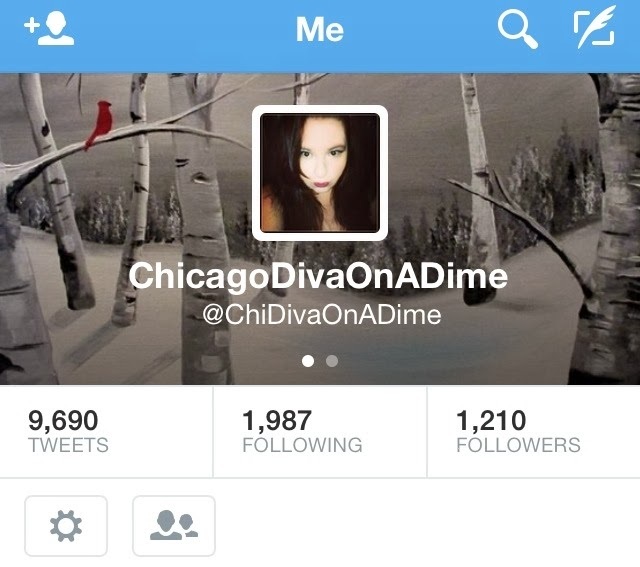 And your URL is your Twitter URL for example http://Twitter.com/Chidivaonadime. Some parties no RSVP is needed you just jump into a party with a hashtag. What's a hashtag? It's a # symbol followed by the name of the party. Example #ShoppingIsFun All you would do is make sure all your Tweets end with #shoppingIsFun! Most parties even the ones you RSVP with require you to end your tweets with their hashtags. Usually on the RSVP or event page it will explain the rules. It's a good idea to follow the hosts too. If you forget just make sure you follow the host. He/she will probably mention the cohosts at the beginning of the party. Then all you have to do is follow along with your hashtag. There are many sites you can do this with. Some parties even will tell you on the event page what site you can use to follow along with. So just jump in and have fun! Hope to be partying with you soon. If your wondering where I've been. Ive been having a Fibromyalgia flare up. For those who don't know. Almost a year ago I was diagnosed as having Fibromyalgia at the age of 33. I had fallen and started having pain. However, I thought the Doctor was wrong. How could I being so young have this disease? Especially after reading the symptoms, I thought that cant be me. I just have back pain but as I paid more and more attention to my body I noticed I had quite a lot of the symptoms. As time progressed so did my symptoms. I went from pain to insomnia to chronic pain to hair loss and just hurting all over. I think the biggest misconception is people say is: "well you look ok". Of course I do! Its not like Fibro is a rash everyone can see. Its inside your body, which makes some people doubt the severity. At least for me on a bad day. It hurts worst then the 2 days of labor I was in for my son. Trust me its that BAD!!! Whats worst is I have lost touch with many friends because I was embarrassed to tell them how bad it was. I mean before the Fibro I was out every weekend being a social butterfly then the fibro came and I became a recluse. Of course my financial situation didnt help either. But now that Im starting to, realize Im stuck with the Fibro I guess I'll just have to change how I live differently. Im just having a hard time with the way people see me. I even had one Doctor tell me I must be better then I let on because I was wearing makeup. I felt pain that day but I was had a mild amount so I did my makeup. What takes me 5 minutes would take others 20. I've been doing it for years so I can do it quickly. And once in a while its nice to try and fix yourself up. Sheesh! Of course by the end of the day because of that trip to the Doctor, I was in bed with horrible pain. As far as my outlook on getting better? I'm impatient as they come. And nothing is working but hopefully soon something will work. I try and be optimistic at least that's what Im going to say to the public. Ok Ive babbled enough for everyone. Hope you enjoyed a little insite into my world.